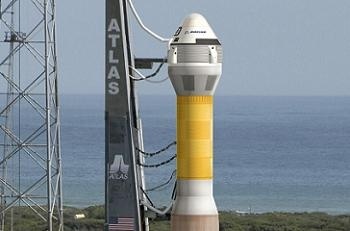 That is correct, with the addition of the 2 extra bags on top in case of stability issues on splashdown. Short version: Optional milestone #21 "Phase 2 Safety Review Board" is split into milestones #21a and #21b. #21a becomes a base period milestone; #21b remains an optional milestone. #21a is "Phase 2 Safety Review Board", due July 2014 with a value of $20M. Term of agreement is also extended from 31-May-2014 to 31-Aug-2014. A mock-up of The Boeing Company's CST-100 spacecraft was put through its third and final contingency water landing scenario at Bigelow Aerospace's headquarters outside of Las Vegas on Sept. 4. The CST-100 is designed for ground landings, but could splash down on the water, if necessary. Through the tests, teams are verifying the spacecraft's landing system will operate as planning during a contingency. Boeing is one of three American companies working with the agency's Commercial Crew Program (CCP) to develop safe, reliable and cost-effective crew transportation systems during the Commercial Crew Integrated Capability (CCiCap) initiative, which is intended to make commercial human spaceflight services available for government and commercial customers. A mock-up of Boeing's CST-100 undergoes a final water contingency landing scenario Sept. 4 near Las Vegas. For the first time, the Mission Control Center (MCC) at NASA's Johnson Space Center in Houston has tested communications with a commercial, crew-capable spacecraft, as The Boeing Company conducted an interface test between the MCC and software planned for the company's CST-100 spacecraft. Boeing has partnered with NASA to develop a fully integrated crew transportation system, with its CST-100 spacecraft and United Launch Alliance Atlas V rocket, in partnership with NASA's Commercial Crew Program (CCP). New commercial spaceflight capabilities being developed by NASA partners through commercial crew initiatives could eventually provide services to transport astronauts to and from the International Space Station, launching from U.S. soil. The August test verified that Boeing could send and receive data from its Avionics Software Integration Facility to the MCC. The company's software facility and CST-100 spacecraft simulator are serving as precursors to integrated flight operations training. "Every day, our connection to the humans living and working in space comes through the historic and hallowed MCC in Houston," said Ed Mango, NASA's CCP manager. "As low-Earth orbit opens to a growing commercial space industry, the ability of new spacecraft to communicate with existing space infrastructure is critical." Through a reimbursable Space Act Agreement with NASA's Mission Operations Directorate, which began during CCP's second phase of development, Boeing is collaborating with the agency on mission planning, training and flight operations for its CST-100. "Our continued partnership with NASA Mission Operations Directorate brings valued experience to our Commercial Crew Program," said John Mulholland, vice president of Boeing Commercial Crew Programs. "This fully integrated team will ensure that we can safely and affordably conduct missions." Additional interconnectivity assessments conducted by Boeing will include software avionics testing for the ascent phase of flight and demonstrations that will put a human at the controls of the spacecraft simulator. A pilot will run through the critical phases of flight, including rendezvous and docking by firing thrusters, navigating state changes and adjusting the spacecraft attitude. Boeing is on track to meet all 20 of its Commercial Crew integrated Capabilities (CCiCap) milestones by summer 2014. All of NASA's industry partners, including Boeing, continue to meet their established milestones in developing commercial crew transportation capabilities. Boeing's CST-100 spacecraft is one step closer to liftoff after a gauntlet of test firings of its steering jets at White Sands Space Harbor in Las Cruces, N.M.
Boeing and Aerojet Rocketdyne recently completed the tests, which simulated the demanding environment of space. The tests assessed how the thrusters -- which fire with 1,500 pounds of force -- will speed up, slow down and move the spacecraft while carrying NASA astronauts in Earth’s orbit. Boeing is developing a fully integrated crew transportation system, which includes the CST-100 spacecraft and the United Launch Alliance Atlas V rocket, in partnership with NASA's Commercial Crew Program (CCP). New commercial spaceflight capabilities being developed by NASA partners through commercial crew initiatives eventually could provide services to transport astronauts to and from the International Space Station, launching from American soil. Boeing is working on development milestones that are part of NASA's Commercial Crew Integrated Capability (CCiCap) initiative. "Boeing and Aerojet Rocketdyne continue to show a path forward for NASA's low-Earth orbit crew transportation needs by implementing cutting-edge technologies and showcasing decades of human spaceflight experience," said Ed Mango, CCP manager. The CST-100's orbital maneuvering and attitude control (OMAC) system has 24 thrusters, giving it the ability to perform critical maneuvers in space such as those required to refine the CST-100's orbit, as well as the braking maneuver near the end of a mission that slows the spacecraft down before re-entry. The OMAC thrusters will be jettisoned when the service module is released from the capsule just before re-entry. Positioned in four clusters of six on the service module of the spacecraft, the thrusters could steer the spacecraft in case an emergency calls for it to separate from its rocket during launch or ascent. During the tests, the OMAC thrusters were fired in a vacuum chamber that simulated the space-like environment at an altitude of 100,000 feet. These evaluations put the thrusters through the burns and stresses they would encounter during a real flight. Engineers equipped the jets with a host of instruments to measure changes in the smallest components. "The CST-100 OMAC thrusters are an example of leveraging proven flight hardware solutions to ensure mission supportability," said John Mulholland, Boeing vice president and manager for commercial programs. "We are very pleased with the data collected during this second series of tests and with our overall team performance as we continue to progress through CCiCap milestones on time and on budget." Previous tests of the OMAC thrusters verified their durability in extreme heat, evaluated the opening and closing of their valves and confirmed continuous combustion and performance. Designers are using the results of these tests to validate or adjust their complex computer models that predict how a thruster and spacecraft will work during a mission. "The OMAC engines met CCiCap test objectives," said Terry Lorier, Aerojet Rocketdyne's CST-100 Service Module Propulsion Program manager. "Aerojet Rocketdyne and Boeing are both pleased with the results and look forward to continuing our partnership." With the completion of its ninth milestone, Boeing is on track to meet all 20 of its CCiCap milestones by summer 2014. All of NASA's industry partners, including Boeing, continue to meet their established milestones in developing commercial crew transportation capabilities. Hat tip to Parabolic Arc for the link. Is this the drop test from April 3rd 2012? Feel close to this project as I can relate to the sizes etc. Is the capsule suppose to bounce like that? Was there a problem with the air bags? Ooo...we have a new contender for the title of vomit comet! I wouldn't want to experience the jarring seen prior to full chute deploy on that release...ouch! So are there no drogues in this parachute system? Because the mains were blasted out directly, it seems like. Or was it not a full parachute sequence due to slow speed or low altitude? They talk about three pilot chutes... and if you look carefully they are there, but they hardly seem to be involved here - mortars seem to trigger the mains almost directly. Boeing and Space Florida recently finalized an agreement to use a processing facility at NASA's Kennedy Space Center, where the company plans to begin building its CST-100 spacecraft in 2014. The former space shuttle hangar, now called the Commercial Crew and Cargo Processing Facility (C3PF), is being modernized to support the new spacecraft. Boeing’s CST-100 is under development in collaboration with NASA Commercial Crew Program to transport crews to low-Earth orbit and potentially the International Space Station. 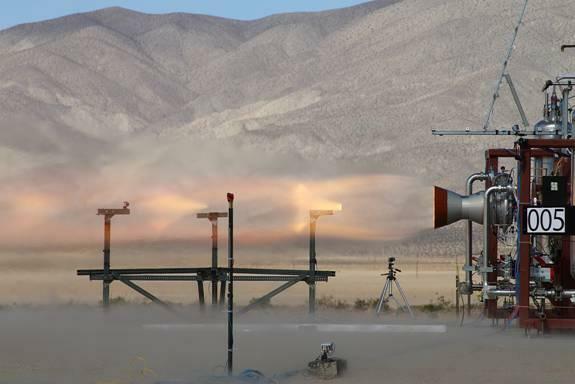 An Aerojet Rocketdyne engine for the Boeing Commercial Crew program produces 40,000 pounds of thrust in an Oct. 22 test in Mojave, Calif.